SPRING IS HERE. The birds are singing, the snow is melting, and the stove is dying. 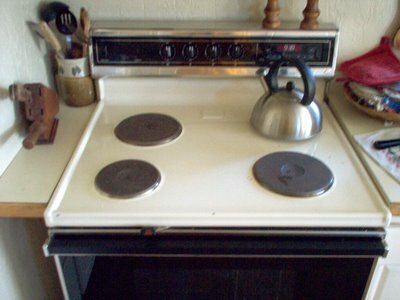 It is my sad duty to report that our stove is no longer with us. No more Christmas honey cookies; the smell of banana bread will fill the house no more. We may never again know the taste of fresh roasted chicken. The stove’s death has left a great power vacuum in this household. Come, we must journey to Sears to begin our search for the One True Stove who will take its place in that vacant corner in the kitchen. Many tears will be shed for the loss of our great appliance, but fear not, for our new oven will bring forth the dawn of a new era of cooking and baking! Yea, our new master shall heat and cool faster than elements of old; it will bring forth dishes evenly cooked! This is not a time of mourning, it is a time of celebration! Long live the stove! Long live the stove! And if it doesn’t, may it be covered in the warranty! — by Dylan. Bobby McFerrin. Dark sunny circles. Bent sky leaning deep over the ocean. Music. The beat drives my typewriter. Smiling. Raining. Sunshine. In the lake. The trees. Parched, dry, death valley days. Ronald Reagan smiles down upon us all. Knowingly. Remembering all. We wait for the door to open. The phone to ring. The alarm to beep, peep, beep. Awake to what is before us. Behind us. We wave as we climb our mountain and stop short of heaven. Bearing the moment. Grabbing the moment to run. The crowd screaming. In the end zone we look around.